David Stern stepped down as the National Basketball Association’s commissioner on February 1, exactly thirty years after his first day on the job. One change that Stern oversaw during his tenure was the introduction of the age limit during the league’s collective bargaining agreements in 2005. While Stern had many positive — and negative — impacts on the league over his tenure, the raising of the age limit was his most recent and has had a domino affect. 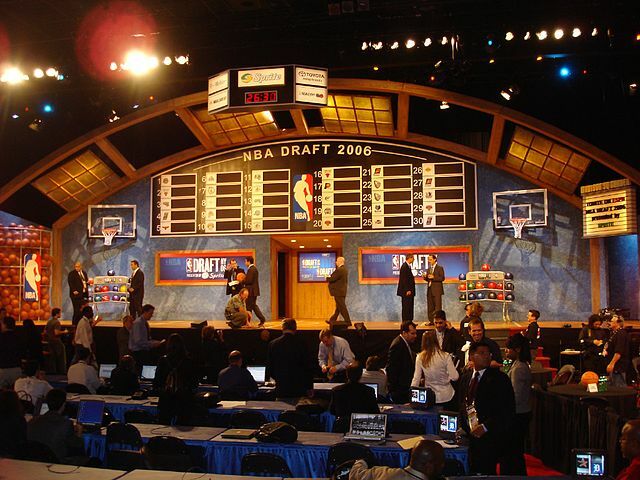 Before that, elite high school players could immediately enter the NBA draft (think Kevin Garnett, Kobe Bryant, and LeBron James, among others). But after raising the age limit in 2005, the top high school players were forced to choose between going to Europe for a year, playing in the NBA developmental league with a smidgeon of an NBA salary, or taking their skills to the college scene for at least a year. Most chose the latter, which in turn kicked off the one-and-done era. Adam Silver, who started working for the NBA in 1992 and was Stern’s right-hand man, took over as commissioner in February. He’s already making some commotion just a month into the job. About a week ago, Silver said at the Sloan Conference on sports analytics that he was in favor of raising the age limit to 20. These comments and the possibility of this rule change — though it would have to be voted on and passed by the players and owners — have caused quite a stir in the basketball community. There are two schools of thought on whether the age restriction should stay its current 19-year-old limit, potentially making it 20 years of age, or abolishing it as a whole. One is that it isn’t fair to young players who have the potential to play and succeed in the NBA (see James and the success he had early in his career). The believers of this argument say that restricting players to enter the draft before they’re 19 ultimately takes money and opportunity away from them. Those who believe that the current age limit hampers these players would obviously not favor an older, allegedly more restricting limit. There’s also a short-term effect that owners and general managers fear if Silver follows through: How the change would alter the draft the first year. Let’s say, for example, that this somehow gets passed and commences following the 2014-2015 season. That would mean that the typical one-and-done player couldn’t leave that year — he’d have to wait another year. Since the draft class has become so dependent on one-and-done talent, the shift could drastically alter the plans of teams that are in rebuilding mode. The argument for the increase in the age limit takes a different track. First, it would change the landscape of college basketball. Since the groundwork was laid when the limit changed to 19 years old, coaches now recruit and plan with the knowledge that the best players will likely leave following their freshman year. This would change that, but not in a bad way. It would only give the NCAA more parity and make it more interesting. From an NBA team’s perspective, the major impetus to change the age limit to 20 stems from scouting and preparation. A 19-year-old, even if he has the skills to succeed in the NBA at the time, is very raw in terms of physique and maturity. An extra year would allow growth in both respects, and this in turn could potentially make him a better investment and player. The change would also give teams an extra year to scout. It’s difficult to determine how and if a high school player’s talent will translate to the professional level, and that was one of the major reasons behind the change to the 19-year-old age limit. While the present rule allows for a year of scouting at the collegiate level, it still doesn’t necessarily show how a player will perform at the next level. Proponents of the mandatory second year make their case based on the theory that more time will enable more scouting, which will then allow teams to more accurately predict a player’s value. There’s a belief that front offices and scouts would benefit from an extra season of scouting. Predicting how a player will change from year one to year two can be an arduous task, so evaluating how they’ll evolve from year two to year three might be more insightful. Silver’s comments are merely surface statements in general: things he’d like to change, but still far from a reality. His first obstacle will be in getting the players association and the owners to come to an agreement. And even then, there’s still the issue of what is best for these young men. At the end of the day, that is — albeit doesn’t seem that way sometimes — what’s most important. It’s not about the TV ratings or financial incentives, but about giving these 19- or 20-year-olds the best road to success. That is what should be the focal point if this idea comes to fruition with the players and owners, whatever the outcome may be.